I've already said it. Superlatives are the best ever. So here is a shout out to what I find to be the (almost) perfect, best lawnmower. In the past ten years, I have owned five different lawnmowers: one electric, two gas (one being self propelled), and two battery powered (one being self propelled). I'm trying to think of a type of lawnmower that I haven't owned, and a ride-on is the only one that comes to mind. There are generally pros and cons to each type. An electric mower usually has enough power to do a decent job and is lightweight, quiet and fairly efficient. The biggest con is that you have to deal with an extension cord crisscrossing your lawn. I'm not a fan. Gas mowers generally have more than enough power to handle any type of lawn. The biggest cons in my opinion is the noise and having to store gasoline. Having little children, I decided that I did not want to have the fuel around or the mess of the fuel that tends to spill when filling the mower. Battery powered mowers tend to be clean and efficient (no fuel or oil to worry about). However, they generally do not have much power, and the batteries usually only hold enough charge for a smaller lawn. Finally, the self propelled models add quite a bit of weight. The self propelled battery mower that I had weighed over 90 pounds, and the battery itself was quite heavy. The battery was large and powerful, but the self propelled feature chewed up a lot of the battery life, causing the mower to lose power before I finished mowing my yard. When I first saw the Greenworks G-Max 40V Lithium Ion mower, I thought that it was just another gimmick mower. I looked into it and realized that the engineers are people who have probably actually owned lawnmowers before, and probably actually did research into what a great mower should be. The Greenworks mower weighs just over 40 pounds. It is extremely light and maneuverable. In fact, I find that I tend to mow a little fast because it is so easy to push. Maybe Mow Jogging will be the next Olympic sport, kind of the summer version of Curling. The mower has two 40-volt lithium ion batteries. For those who may not be familiar with lithium ion technology, it is a powerful rechargeable battery that has little to no memory (which is actually good in a battery), little energy loss while sitting on the shelf, less weight than traditional rechargeable batteries, and a great energy density. The energy density allows the battery to run at full capacity until it is depleted, which means that you don't get the slowdown effect that you get with other rechargeable batteries. These batteries run at full speed and then stop, kind of like a two-year-old. So this mower will run off of one battery at a time. When the first battery is depleted, you get a little power interruption, indicating that the mower is switching to the next battery. The mower also features a variable power feature. This means that when mowing thick, heavy grass, the mower will run at full power. When the mower does not need full power, it will reduce the amount of power going to the blades to conserve battery life. Wait a minute. Did I say blades? Yes I did! This is where the Greenworks engineers really thought this through. Electric mowers generally have a smaller blade which means a smaller footprint. That means that the cut is not as wide, which means more paths up and down the yard. A larger blade requires more energy (torque) to spin, which does not make for an efficient battery life. However, the Greenworks G-Max mower has two short blades. They run side-by-side, giving the mower a 20" cutting path, something that few battery powered mowers have been able to accomplish. Its light weight combined with the lithium ion batteries means that this mower will run for a long time, making this a viable option for those with larger yards. In fact, I often mow my large yard with this mower without it kicking over to the second battery. The Greenworks mower also offers the option to bag clippings or mulch. In case you're not sure which to do, I almost always mulch my clippings. I would rather see the clippings fertilize my lawn than throw them in the landfill. The mower also has a one lever height adjustment, which means that all of the wheels are adjusted at once. Are you ready for one of the coolest feature? This mower is quiet. It makes about the same amount of noise as a box fan on high speed. That means that I can carry on a conversation while mowing, I can hear what is going on around me, I can listen to music, or, very importantly for a Renaissance Dad, I can mow at night after the kids are asleep. So what are the cons? To be honest, the drawbacks are minor. The first is the way the Greenworks mower handles the corners of the yard. Because the twin blades are in the middle of the mower, It is very difficult to mow the corners. I just hit them with the string trimmer as I am doing the edges. I believe that this is a very small tradeoff in having this mower. This mower also struggles when trying to cut too much thick grass. Before I put in my winter lawn, I tried to cut the old summer lawn as low as possible. The grass was too thick for this mower to handle, and I was too impatient to incrementally cut the lawn. The final drawback is the price. This mower retails for around $400. I could never pay that for a mower, so here's what I did. I am a regular Lowe's shopper. When I decided that this was the mower for me, I checked on it every time I went to Lowe's. During one visit, I noticed that they had one of these mowers that they were selling as an open box. Cha-ching! To further reduce the cost, I sold my then-current lawn mower on Craigslist. So the total out of pocket for this mower was $100. Now I could have easily justified the $400 price tag, considering that I would never need to purchase gasoline or oil. And because of the weight I have fewer chiropractor visits. And because of the quietness I do not suffer from hearing loss. So you can see that this mower easily pays for itself, but I still liked finding ways to reduce the initial out-of-pocket. Parenthetically, CPOoutlets.com is a great place to purchase out-of-box and factory reconditioned lawn and power tools. At the time of this publishing, they offer this mower for $359. They regularly have 10% off coupons, so that would bring the cost down even more. What would I like to see in this mower in the future? It really doesn't matter, since I'm planning on owning this forever. But if the engineers ever decide to redesign it, I think a couple of LED lights on the front for night mowing would be pretty cool. Aside from that, I think I have found the perfect mower. If the other Greenworks products are as exceptional as this mower, I will probably slowly add those to my collection. Oh, I just thought of another addition for future engineering: a flux capacitor with Mr. Fusion attachment that utilizes the grass clippings for time travel! 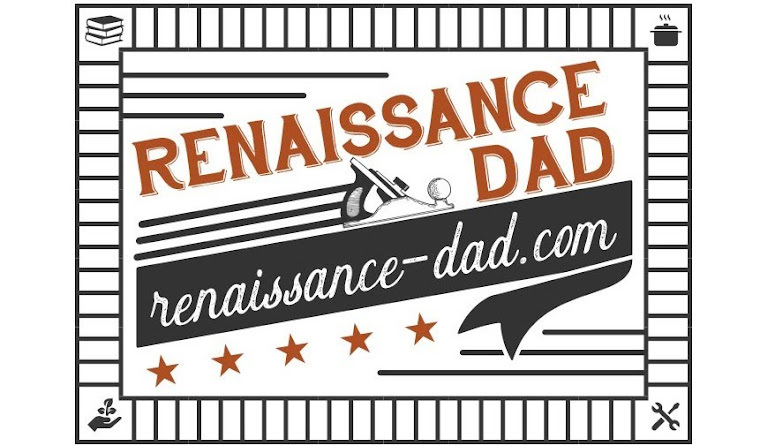 Now that's a mower that this Renaissance Dad would spend some money on!